Documents in this summary are part of the Cincinnati Historical Society archives. Corporate History Timeline now online. Click here. Find more photos and info. in the Delta Queen Delta King section, click here. 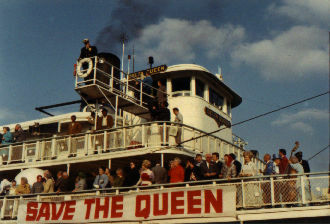 Read about Garmatz's role in the Save the Delta Queen struggle of 1970. A comprehensive visual history of the world's most famous overnight passenger-carrying river steamboat chronicled through historical documents, photos and film footage. This video, by The Delta Queen Steamboat Co. and Jerry Sutphin, illustrates the remarkable history of America's favorite steamboat. To purchase a copy contact: Jerry Sutphin.